Installing a beautiful in-ground pool in your backyard can completely transform the look and feel of your outdoor space. To make the most of it, you also need to install an in-ground pool patio that will allow you to use the area around the pool for relaxing, entertaining and having a good time. 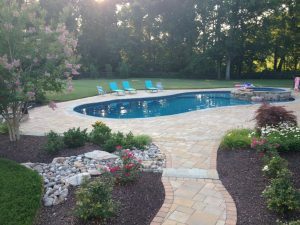 VistaPro Pools & Spas has helped many homeowners throughout Maryland and the Washington, D.C. area with the process of installing both an in-ground pool and a new in-ground pool deck around it. 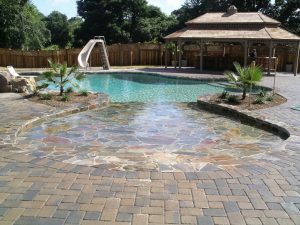 We can use just about any material you want to build your pool patio, and when we are done, your pool deck will look welcoming to all those who gather around your pool. An in-ground pool patio can be used in a variety of different ways. Others want to go all out and build a pool patio that is can accommodate tables, chairs and everything else you need to host company or enjoy a nice day by the pool. Regardless of what kind of pool deck you’re looking for, VistaPro Pools & Spas can help you come up with a design that fits your needs. We want you to love your pool patio when it’s finished, so we will show you plans for different shapes, sizes and designs throughout the creation process to help you consider your options and pick out the design that works best for you. 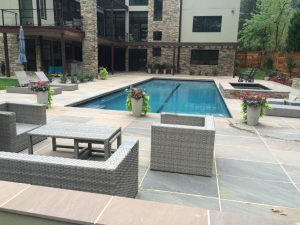 You have invested a lot of time, energy and money into creating the perfect pool for your property, so it only makes sense that you should invest that same kind of time, energy and money into your in-ground pool patio. It will help you to enjoy your pool more, and if you design your in-ground pool deck the right way, it will get just as many compliments as the pool itself. Whether you want a pool patio made out of concrete, stone, brick or some other material, VistaPro Pools & Spas can design the pool deck of your dreams. If you are ready to start planning your in-ground pool patio, let Vista ProPools & Spas know. Call us at 301-805-0119 today for more information on how we can install the custom pool patio you’ve always wanted.